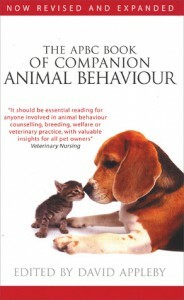 The APBC Companion Behaviour Book starts off by warning the reader it is for professionals and new pet owners to consult. It covers many issues such as the legal issues regarding animals, training, basic behaviour problems and proper care of cats, dogs and rabbits. The book covers everything it promises in the first chapter, informs you of the basics of animal behaviour sciences and focuses on animal welfare. So far so good. If this is all you really need, expect or want out of your reading experience you will be 4 staring this book. I purchased this book on the basis that it had legal information and a whole chapter regarding animal aggression. I have a dog who is currently dealing with aggression issues, and was hoping for a basic outline on recent studies concerning canine aggression. Unfortunately the chapter merely outlined information that was already obvious - how an aggressive animal react to given stimuli. DUH. I found that the book lacked any references to studies other than the ones that the author had taken part in, and did very little to back up some claims (cats are more likely to die if let out at night? Really? What study concluded this? None it seems.). I had an overall feeling of skimming through subjects without any real substance. The book, for a seasoned animal owner, was a bit of a waste of time. I feel like I didn't learn anything NEW about animal parenting (except for rabbits which, until recently I had no idea you could BATHE them. Clueless? I think so.). The legal issues section at the end was completely useless. A rattling of UK and Scotland Acts and the basics of their contents. Animals must be allowed time outside, fed, access to water, and not harmed. You don't say? Although a good start to any journey learning about the necessities of owning an animal, professionals will NEVER find need to consult this book. There absolutely NO backing up of details, and although Im sure the APBC is a big deal in the UK, even they should be referencing to individual works. Its just good academic practice. I thought I was getting something professional, academic, and informative on the most base level. I got drivel that I most certainly feel jipped out of the $30 I spent on it. That said, the book gets a 2 star rating because it delivered what it promised in the first chapter and would be a great resource to someone who has never owned a pet before.